This little fellow comes from a series of drawings I started on the original blog, and I'm still continuing it. Unfortunately, I don't think you will see a lot of them since most of his aphorisms involve french puns ( they are often the only point of the drawing ). I will every now and then translate one or two of his appearances when there is no play on words. 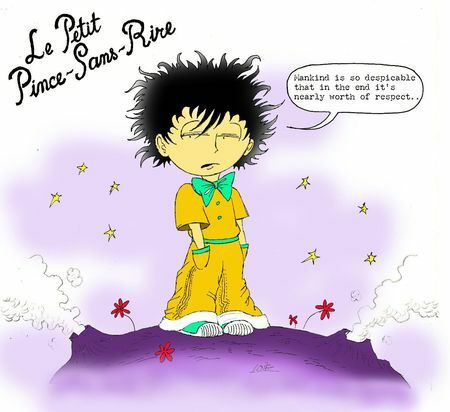 He was created as a spoof of Antoine de Saint-Exupéry's classic of litterature, " Le Petit Prince " ( " The Little Prince" ), a children story about a little boy living on a ridiculously tiny asteroid and having naive remarks on life. My version is dark haired and named " Le Petit Pince-Sans-Rire ", which is yet another pun of word in french. "Pince" sounds similar to "Prince", and a "pince-sans-rire" is how we call somebody with a cynical and dry wit. Commentaires sur The Little "Pince Sans Rire"